The geology and soils of Oakville and the greater Napa Valley are notoriously complex. They are the product of slow collisions between the North American plate and the Farallon plate, and later the Pacific plate, over the past 140 million years. The friction and entrained water subducted between these land masses formed the inland Sierra Nevada mountain range, the upthrust ancient sea bedrock formations, and the wildly heterogenous Franciscan rock series. 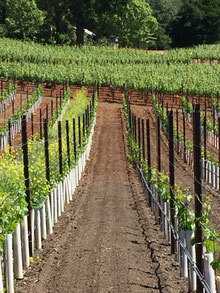 These series comprise some of the bedrock of both the Mayacamas and Vaca Mountains on either side of the valley. More recently, with the San Andreas faulting, an episode of volcanism swept through the valley between nine and three million years ago. The soils of the Oakville district are broadly categorized into three types. In the hills, residual soils are created from the breakdown of the various bedrock units. Along the margins of the valley just below the hills, distinct alluvial soils form on the fans composed of material washed down from the adjoining hills during torrential rain events. Along the axial part of the valley where the Napa River flows are fluvial soils, finer grained loam coming from up stream locations and deposited from flood waters. The Mayacamas range to the west is composed primarily of a combination of ancient Pacific sea bedrock formations composed of a heterogenous assortment of greenstones, deep sea cherts, sandstone, limestone, serpentines, shales and other metamorphic rocks known as the Franciscan formation, which is debris washed down from the ancient Sierra Nevada range and the younger Sonoma Volcanics. At the base of the Mayacamas, the western side of the Oakville AVA is dominated by three large alluvial fans made up of gravels, clay loams and bale loams—sediment and rock carried down the mountains by gravity and streams on Mt. St. John - and hills to the south - flowing down toward the Napa River. Comprised of rock fragments, sand and clay, these sedimentary fans spill out across the Oakville district and create a subtle slope of less than two degrees down to the Napa River plain. This gentle slope and relatively coarse grained fabric allows excess rainfall to flow into the Napa River from the western side of the valley. On the eastern side of the Oakville AVA, the soils reflect the volcanic strata of the Vaca Mountains, which are largely made up of exposed andesite with some volcanic tuffs. Locally, some occurrences of debris from the Franciscan formations washed out of the Lake Hennessey area along the ancient Conn Creek drainage. On Oakville’s eastern side there are also alluvial fans, but they’re shorter and less broad. The flats of the Napa River flood plain transition more quickly to the exposed rock of the Vaca range, and do so in more sudden step-like formations, the result of the Vaca range having broken down from its previous heights long ago. The climate of Oakville is the unique result of a number of natural weather influences. The cool northern reaches of the San Francisco Bay and the warmer inland air of California’s central San Joaquin Valley combine to provide the temperate Mediterranean climate in Oakville. The gentle tug of war between these cooling and heating influences creates the daily weather patterns that make Oakville an ideal place to grow grapes. In general terms, and as American wine regions are classified, the climate of Oakville is considered moderately warm. The University of California at Davis developed a system of classifying growing regions of the state, from the coolest (Region I) to the hottest (Region V). The Napa Valley becomes warmer as it extends north from Carneros and the San Pablo branch of San Francisco Bay, with the Mayacamas range to the west protecting the valley from incursions by cold Pacific Ocean air. Driving north through Carneros, then Napa and Yountville, you are in what is considered a Region II growing area. Then, just at the small town of Oakville, Napa Valley transitions from a Region II growing area (similar to Bordeaux) to a Region III growing area (similar to the Rhone). What makes Oakville’s climate distinctive is its transitional, mid-valley location. Oakville is just far enough south to receive regular morning fog from the San Pablo bay. This slows the warming early in the day. 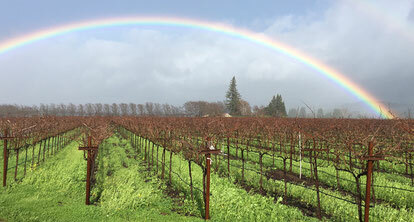 But after the fog blows off in mid-morning, Oakville receives the full benefit of the afternoon Napa Valley sun. In the afternoon, when temperatures begin to peak, the bay blows cool breezes north to Oakville to begin again the cooling cycle of night that preserves the color and acidity of wine grapes. The result is that during most of the growing season, Oakville is about one degree cooler than Rutherford, three degrees cooler than St. Helena, and eight degrees cooler than Calistoga. Average low temperatures in Oakville are generally in the low 50s in March, with highs in the mid-80s during July and August. Daytime highs often reach the mid-90s in mid-summer before the sun sets behind the Mayacamas Mountains.